On 5.6.2013 celebrated our beautiful Indy 4 years. We wish you all the best! 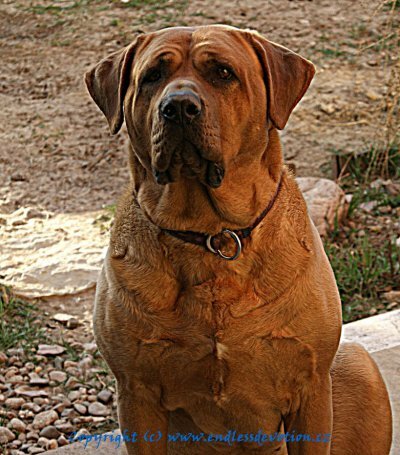 Sunday: Lyonette - Exc 1, CAC, CACIB, BOS!!! 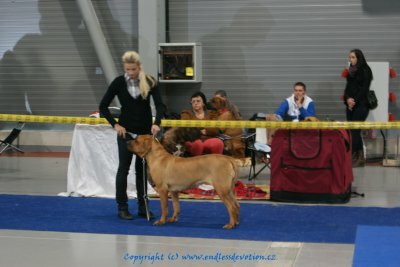 On this dogshow Lyonette has fulfilled conditions for obtaining title INTERCHAMPION (C.I.B.) !!! We have also send request to FCI for obtaining this title also for Indy , waiting for processing. 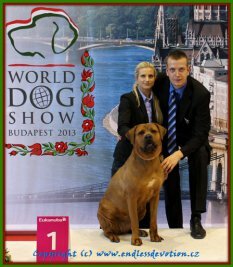 This years World dog show was a premiere for me and my female, there were entered a lot of competitors (there was 75 tosa representatives from many European countries). The biggest joy I have from our results which we had won! For company and support big thanks to kennel Malizi doghouse and Daniel Hrežík. 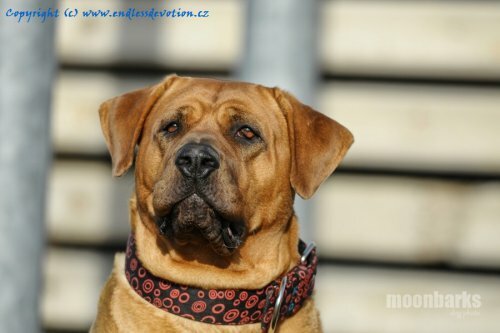 On 4.5. we have spend beautiful sunny day on clubshow in Slovakia and my tosa inu female Indy and male Jimi from my friend both got nice titles in champion class. 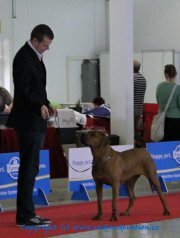 JIMI - Excellent 1, CAC --> Grandchampion of Slovakia !!! 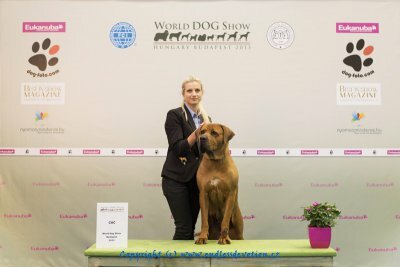 Big congrats from us to owner Kristýna Malinovská (kennel Malizi doghouse) !! 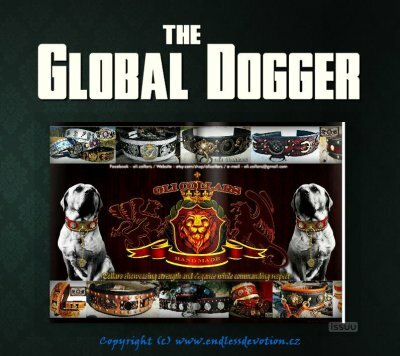 Today international online magazine GLOBAL DOGGER published new issue and canadian producer Oli Collars has chosen without my knowing it, for the representation of their collars again our little girl. We are very happy, it's a huge honor for us! On 1.5. has celebrated our beautiful Lyonette her 3rd birthday. Its nearly 1 year since she started her successful show career. We wish you so much success also in next years, a lot of health and be so amazing companion as you are. 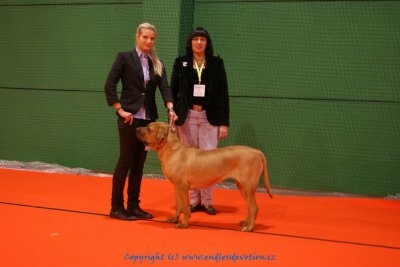 On this prestigious show Lyonette appeared with her new handler and in strong competition got nice result Excellent 2, res.CAC , and fulfilled conditions for obtaining title CHAMPION OF SLOVAKIA! For handling big thanks Daniel Hrežík and for photo Dušan Pohl. We would like to thank for company for whole weekend Malizi doghouse kennel and congrats to great results of their dogs (Jimi + Eisai) ! Thanks for company kennel Malizi doghouse, congrats also to beautiful results (Eisai CAC, Jimi CAC CACIB BOS) and looking forward to next dogshow. We went to this dogshow with our LYONETTE. She had very nice success in competition, on Saturday Exc 2, res. CAC and on Sunday Exc 1, CAC. But we dont have any photos. 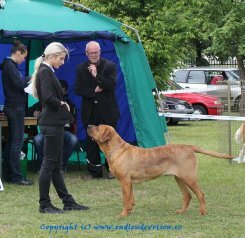 After long time we went for a trip with kennel Malizi doghouse to whole weekend dogshow in Slovenia with both our girls, Jimi a Vinnie. We all have recieved more than beautiful titles. JIMI: CAC, Clubshow winner and BOB! 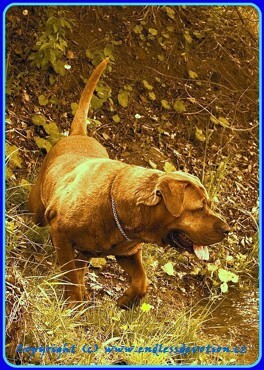 New photos of our INDY ! 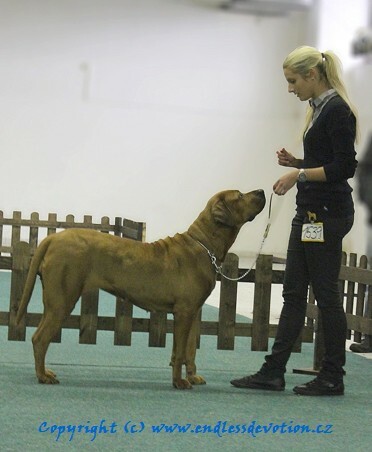 We have participated with INDY on IDS Prague, when both days she got Excellent 3 . 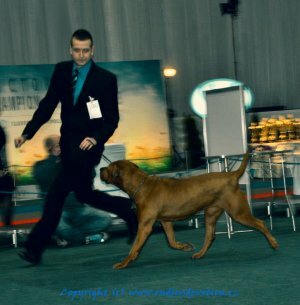 Congrats also to Jimi to his results 2x CAC (kennel Malizi doghouse) and thanks all our friends for nice weekend.